How to reach new audiences is a continuing preoccupation of the 'serious music' community. Yet just this week a surprise classical best-seller has shown how to do it. You don't need dumbing-down, the latest avant-garde tricks, classical music night-clubs or free Beethoven MP3s. What you need is great contemporary music which is innovative, honest and accessible. It needs to be recorded by an enterprising label, with top-class performers and engineering. It also needs to feature a marketable personality and be supported by the media. Cloudburst, a CD of Eric Whitacre's choral works sung by Polyphony, is currently the surprise UK classical best seller. It hit all the hot buttons, and proves that a full price CD of music written in the last fifteen years can outsell the TV promoted greatest hits of a dead guy from Salzburg. Andrew Cane of leading UK independent classical store Prelude Records explained to An Overgrown Path yesterday: "Cloudburst had been out for two weeks when BBC Radio 3's CD Review gave it an outstanding review. Then the rush started, and we took more than ten orders just on Saturday. 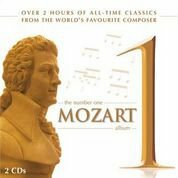 That was double our next best seller - a TV advertised 'Best of Mozart' compilation. Sales of Cloudburst have also been very strong this week, easily outselling the big January release of the 2006 New Year's Day Concert conducted by Mariss Jansons. 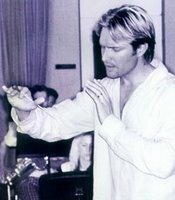 We are delighted, but it is really quite surprising as Eric Whitacre is almost unknown here." The success of Cloudburst has been reflected in the US where within a day of being released it entered the Amazon top ten classical best seller list. Eric Whitacre was born in Nevada in 1970, and played synthesizers in a teenage techno-pop band before graduating from the Juilliard School of Music where he studied with John Corigliano and David Diamond. 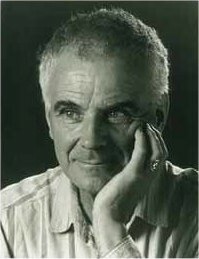 His musical voice is unique but fundamentally conservative, and he has been described as the 'anti-Tavener' because of his disregard for fashions such as the so-called 'holy minimalism', although the setting of the biblical text When David heard does pay homage to Arvo Pärt. 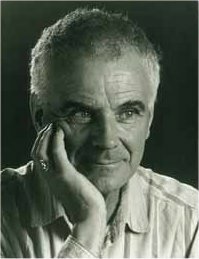 It is no bad thing, but I do also clearly hear the influence of another unique voice in the form of Peter Maxwell Davies (right), particularly Max's 1981 Lullabye for Lucy. (Opening the link launches an audio file of this sublime work). Whitacre is a master of harmony, but is a million miles away from the 'comfort music' of John Rutter and others. Despite Eric Whitacre's popular appeal there is no complacency in his writing, and he keeps the listener on the edge of their seat with shifting chords and startling harmonies that confirm his pop/rock roots. Above all it is his ability to make music the servant of words that distinguishes his vocal works, and this is reflected in his eclectic choice of texts. 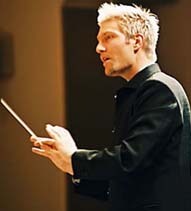 Whitacre's choral works, which include Water Night, Cloudburst, Sleep, Lux Aurumque and A Boy and a Girl, are hugely popular in the US, and his compositions for symphonic winds are also frequently programmed, particularly Ghost Train which has had over a thousand performances and forty recordings. 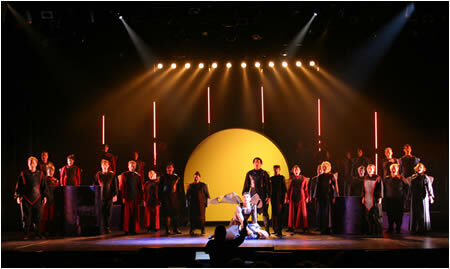 One of his most recent compositions is Paradise Lost (production shot right). He describes this, his first work for stage, as an 'opera electronica', and it combines trance, ambient, and techno electronics in a genre crossing combination of choral, cinematic and operatic forms. 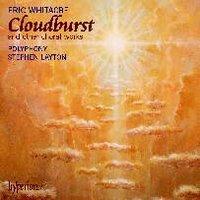 Cloudburst was recorded by Hyperion, and takes it name from one of Eric Whitacre's best known choral works which sets a poem by Nobel Prize winner Octavio Paz. The CD features fourteen settings of poets as diverse as Dickinson, Lorca, Cummings and a 13th Century Persian Sufi mystic. 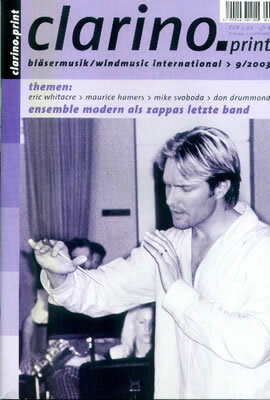 It was recorded in just three days with Stephen Layton directing the vocal ensemble Polyphony who do not include Whitacre in their core repertoire. Polyphony are outstanding in any music, and they rise magnificently to the new challenges set by Eric Whitacre. The lines are exposed and there is no vibrato to hide behind, yet the result is one of the best choral releases I have heard for years. All credit to Hyperion for this innovative release, and to Simon Eadon’s superb engineering in London’s Temple Church (where Stephen Layton was Director of Music). The sound is demonstration quality, particularly in the title track which features piano, percussion, handbells, thunder sheet, wind chimes, a suspended cymbal and, shades of Max, a children's choir. That is some beautiful choral writing - reminds me a lot of Pärt, and possibly Howells in places; but then thick choral harmonies always sound a bit like Howells... That CD cover is horrible though and has put me off buying the recording before now, but maybe I'll give it the benefit of the doubt now. Tim, the CD inlay is marginally better in the flesh than it is reproduced on the article, but I know what you mean. Hyperion seem to have a particularly dated feel to their graphics. Hyperion CD inlays are also always the worst to reproduce in small sized images for some reason. I usually try to avoid using them for that reason, but this one seemed part of the story. But as you say this is a fine CD that is well worth exploring, even if there are undertones of Pärt, Howells (now there is a composer we should spemd more time on) and of course Peter Maxwell Davies. The bottom line is people are buying Cloudburst and the only gimmick on it is a thunder sheet. This is all excellent coverage, Pliable, and much appreciated. Wonderful to see all this fantastic response to my article, and the readership figures are superb. This link will take you to the Brigham Young University Singers recording mentioned in SJZ's comment. The art is definitely weak. The templated look makes it seem bargain basement rather than something special. The album I picked up recently that impressed me both in music and packaging is So Percussion's recording of "Drumming". I had the chance to sing two of Whitacre's pieces a couple of years back -- Lux Aurumque and With a Lily in Your Hand. His music is even more fun to sing than it is to listen to. Absolutely gorgeous. I'll bee picking that up ASAP. Thanks (again) Pliable. I am currently working on part of my dissertation that will include Eric's innovative techniques on music promotion. Specifically I will explore how Eric has been able to harness the flexibility and power of the internet to promote his music and career. I would appreciate and entertain any comments that anyone would like to make. Please visit my blogspot. Cloudburst certainly was a good CD, but as a long time listener and performer of Eric's works (well, three years), I have a few complaints. The most annoying thing about this CD is that the two sets of three songs are provided out of order, including Three Songs of Faith (the Cummings' songs), which all explicitly say 'attaca' in the music. Perhaps new versions of the music came out, though, since the ending to 'i will wade out' has been significantly changed. Polyphony sounds beautiful as always, though due to the very dense harmonies, they are sometimes stretched thin - the 18 part chord on 'When David Heard' being an example. They are, however, very well suited to Morten Lauridsen.